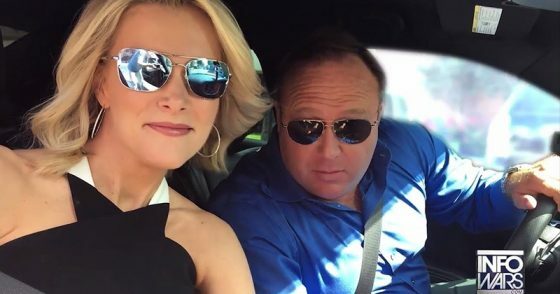 The Megyn Kelly-Alex Jones show, scheduled for Father’s Day, says everything you need to know about the sharp decline of the media in America. An overpaid interviewer for NBC News is sitting down with a pro-Russian agent of influence who masquerades as a conservative and exploits human tragedies in order to sell vitamin supplements and toothpaste. Jones is not, and never has been, a conservative. It’s true that he sometimes pretends to be one. He also says he’s fighting “communists,” while he plays directly into their hands, generating more heat than light. More than seven years ago we noted how Jones was useful to the Kremlin and its propaganda apparatus, and was breaking up legitimate conservative gatherings with a bullhorn. He was a classic agent provocateur. This makes two disinformation agents in Kelly’s first three shows. The first was Vladimir Putin himself. Jones claims to be a patriot, but was appearing on the Putin channel, Russia Today, before the intelligence community and Democratic Party concluded that it was an instrument of Moscow. We exposed RT’s Russian funding and carriage by media giants such as Comcast long before it became an issue during the 2016 campaign. Under Jones, his Infowars.com website became an apologist for Russian aggression against Ukraine, even disputing that the Russians shot down Malaysian Airlines MH17 over Ukraine. He also went on RT to defend Russia’s naked aggression against the former Soviet republic of Georgia. Stories about the Kelly program highlight President Donald Trump’s appearance on the Alex Jones radio show. Kelly says this fact, and the granting of White House press credentials to Infowars, make Jones newsworthy. But it was Matt Drudge, the king of conservative media, who made Jones popular before that. He and Jones are friends; Drudge regularly links to stories on the Jones website. The Drudge connection is important, and it would have been far better for Kelly to have tried to get a sit-down interview with this reclusive character. Drudge has made millions putting conservative headlines on articles that come mostly from the liberal press. He aggregates news for conservatives, reducing the amount of time it takes to go over dozens of websites. This function is now called “journalism.” Drudge generates “clicks” for conservative websites hungering for eyeballs. Some conservative sites and personalities are desperate for a link on Drudge. It can make or break them. Jones specializes in offering a narrative different than that of the liberal media. On occasion, he will have a legitimate conservative on to offer hard news. Before he made it big on Fox News, Tucker Carlson appeared on the Alex Jones show. It was a love-fest. Unfortunately, Jones too often veers off into lunatic fringe territory. In addition to casting doubt on what happened at Sandy Hook, Jones ran Voice of Russia stories about the Boston Marathon bombing being a hoax. He has long been known as an advocate of the view that the United States attacked itself on 9/11, the so-called “inside job” theory also promoted by Moscow and the Arab/Muslim world. Jones exploits a basic human weakness. Many people would rather be led to simple and dramatic conclusions that reduce the need for critical thinking skills. Jones offers scapegoats and easy answers for what goes on in the world, virtually eliminating the need to analyze and research what is actually happening. People who believe him think they’re sharing inside information. As a result, his audience tends to believe that the Bilderbergers are more of a threat to the U.S. than Islamic terrorists or Russia. Jones was forced to admit under oath recently that much of what he does is an act. He’s playing a character, though he plays it to the hilt. True or not, it’s hard to reconcile the two positions. Alex Jones lacks integrity. As for Kelly, she’s just a bad interviewer. When she was on Fox News, she interviewed former communist terrorist Bill Ayers, letting him get away with whoppers about his “anti-war activism.” Ayers was never against the Vietnam War; he was always for a communist victory. Members of his terrorist group went to Cuba and Russia. Kelly let him go on before saying, “Let’s move on.” So she let the lie stand. With that comment, Putin was reverting to his KGB days, trumpeting old disinformation, and venturing into Alex Jones territory. Kelly could have noted that JFK’s killer was a Marxist who had spent time in Russia, had visited with Cuban officials, and had also tried to kill right-wing U.S. Army General Edwin Walker. But she wasn’t prepared for the interview. As the parents of the children killed at Sandy Hook are saying, there’s nothing inspirational about Jones. He is indeed accomplished, in the crass sense that he exploits people and sells them products such as overpriced toothpaste. Why did Adam Lanza kill those kids and the educators at Sandy Hook? America would like to see some serious investigative reporting into this question. But calling Jones a “conservative” is like calling Kelly a journalist. She’s being paid big bucks because her job is to make big bucks for NBC News. Let’s not pretend otherwise. But this arrangement works both ways. Look at how the Jones website is hyping the show—with a photo of Jones and Kelly in a car together, with a smile on Kelly’s face. Jones is not smiling, but he should be. He’ll be making money, too. If one of the topics, as advertised on the Kelly show, is the “future of the media,” then the show itself stands as an example of the curious turn that the old and new media have taken together. We can do better than both of them.